It’s Caturday, and I have decided to expand my definition once again to include not just animals but also things that aren’t alive that look like things that are alive. "C’mon, man, wash your feet first!" "Keep us off the cold tile floor you jerk!" "Store us next to those yakkity flip-flops again and we’ll make sure the cat leaves you a ‘present’ before you stick your feet in us next time!" 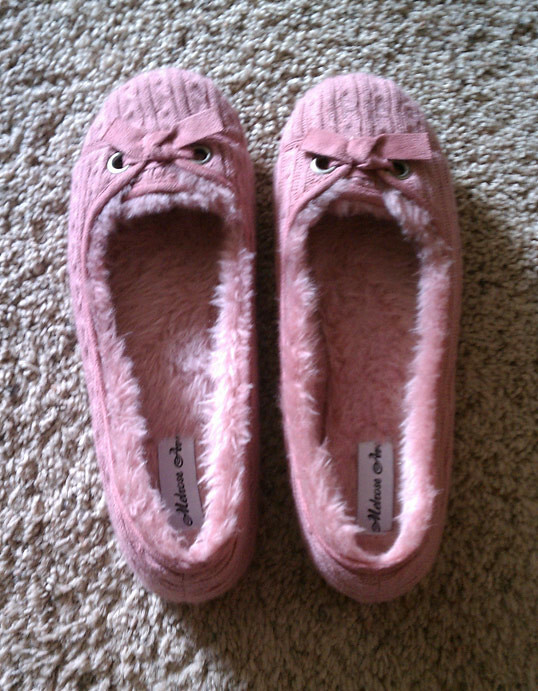 "We’re a pair of slippers, not a pareidolia of slippers!" "Wear socks with us again and we swear we’re calling Stacey London!" These slippers were a gift from my mother-in-law to The Little Astronomer, which just goes to show you the world’s a pretty funny place if you keep your eyes open and sense of humor primed.